Although the Bodyguard T280C treadmill has seen a recent price increase, it remains a strong choice for a high-end, high-performance home treadmill. On the LED mono-color display, you get a graphic profile, a 12 digit scrolling screen, and quick speed/program keys. Programming includes 12 pre-sets, plus 3 Heart Rate Control workouts, 4 Learn programs, and 4 User IDs. Unit Weight/Dimensions — 273 lbs; 78" x 29.5" x 53"
The Bodyguard T280C treadmill features a 3.4 HP (3600 rpm) drive motor, 2.5" rollers, a one-piece fully welded steel X-frame, and an Advanced Friction Detection System (AFDS) which prevents overheating of the motor by verifying, in real-time, the friction level between the running belt and the deck. Its 1" thick 4-way deck (the platform underneath the belt) can be reversed and/or rotated for superior long life. Additionally, the silicone keys on the console are able to withstand over 5 million touches. 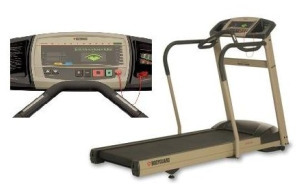 The Bodyguard T280C also features an iTek (Intelligent Technician) diagnostic system, which is an on-board computer program that continuously monitors the treadmill’s performance levels, and the Electronic Stride Control (ESC) ensures that the selected speed remains the same regardless of the user’s weight or the incline selected. 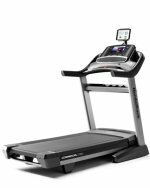 The Bodyguard T280C model also features the Bodyguard Dissipation System Plus, a system that provides superior shock absorption performance on the treadmill deck. The BDS+ has a high durometer rating (measure of hardness) to provide better protection for heavy users or runners. Bodyguard installs this exclusively only on X-frame treadmills. Treadmill reviews on the Bodyguard T280C have been outstanding. It is a superb quality machine with no reported design flaws or mechanical issues. Because of the performance, comfort level, quiet operation, easy of use, one-piece welded frame, big user capacity, and best warranty in the business, this model is tough to beat. The $3,699 Bodyguard T280C treadmill is priced $400 more than the T280P model (at $3,299). They are the same machine except that the P-model has a standard belt and the long handlebars are optional while the Bodyguard 280C model has an ortho belt. Normally an ortho belt makes the motor work harder and is problematic for many treadmill designs, but with the Bodyguard BDS+ system on board, overheating isn’t an issue. Nevertheless, for the big price difference, we recommend you save the bucks and go with the T280P with the standard belt. You won’t notice much of a difference and value wise, the T280P makes the best sense.